Microsoft offers 15 GB of email storage space per free Outlook.com account. Office 365 Home and Office 365 Personal subscribers get 50 GB of space. "Quota Exceeded, your account is above quota limits"
If your mailbox is full, we will send you a message telling you that your account is above quota limits, and you won't be able to send or receive any messages. Also, people who send you email will get an error message that your inbox is full. You can see how much storage you've used in Settings. To make room in your mailbox, try these solutions. Empty your Junk Email folder by selecting the folder and selecting Empty folder. Empty your Deleted Items folder by selecting the folder and choosing Empty Folder. Tip: You may also need to delete all your recoverable items too. Go to your Deleted items and select Recover items deleted from this folder and select Empty folder. 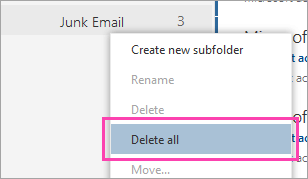 Use the Sweep button to quickly remove unwanted email from your inbox or archive folders. Sweep lets you automatically delete all incoming email from a particular sender, keep only the latest message from that sender, or delete email that's older than 10 days. To sweep your inbox, choose a message you want to sweep, and select Sweep. 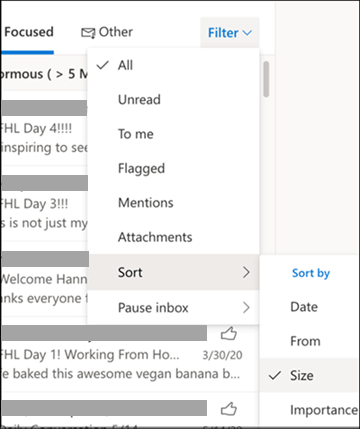 To learn more about Sweep, see Organize your inbox with Archive, Sweep, and other tools in Outlook.com. Saving photos and documents to OneDrive is another good way to make room in your inbox. At the top of your message list, select Filter > Sort by > Size. Note: If the message list sorts the smallest messages on top, click Filter > Sort by > Size again to put the largest messages on top. Select the message containing the attachments your want to upload to OneDrive. Under the attachment, select Save to OneDrive. For All images, find the corresponding email in your mailbox and delete it. For Sent images, go to your Outlook.com sent items, find the corresponding email and delete it. After deleting the email, you also need to delete it from your Deleted Items. Go to Deleted Items, select the item(s) to remove, and select Delete. 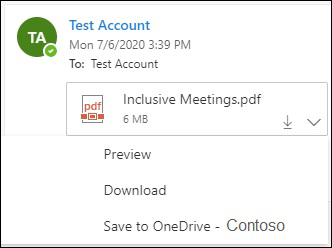 Note: If the email is important, save the images to your computer or OneDrive, forward the email to yourself without the images, then delete the original email.